INDUSTRY.co.id - Jakarta - House Representative Vice Chairman Taufik Kurniawan stressed that the act of terror against the press cannot be justified and deplore acts of terror and threat committed a group of people to the editorial office Radar Bogor in Bogor, West Java, Wednesday (30/05/2018). He said the act of abduction using violence by a group of people who were in the name of the Bogor Democratic Party of Struggle (PDI) could injure Indonesian democracy. According to him if indeed a party objected to the news made by the press can complain to the Press Council, not with acts of violence and terror. "If there is any disagreement with the news by the press, we can report it to its parent, the Press Council, and it should not be a terror for the press so that the freedom of opinion of the press gets intervention," he said. Taufik, who is also Vice Chairman of the National Mandate Party (PAN), said that the settlement can be done by sitting together and dialogue, not with acts of terror and anarchism because the action can be a bad precedent for freedom of expression. According to him, the incident should not happen again, especially done at the beginning of the political year because it can disrupt the atmosphere of coolness and potentially appear disunity. Previously, the cadres and sympathizers of the PDI Perjuangan came to the Radar Bogor Office on Wednesday (30/5), carrying motorcycles and loudspeakers. 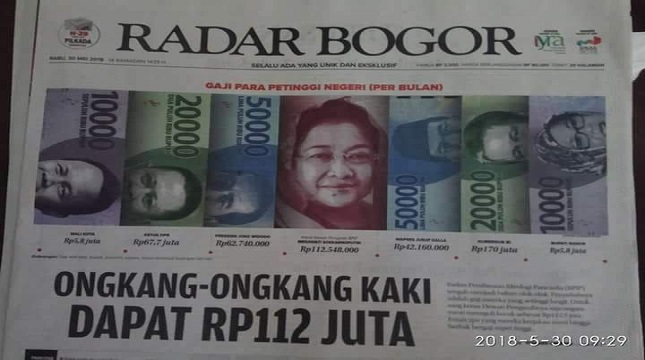 The action was triggered by reporting Radar Bogor featuring Megawati photo with the title "Ongkang-ongkang Leg Can Rp 112 Million". The Indonesian Democratic Party of Struggle (PDI Perjuangan) thought the news was very tendentious.